This dry Argan Facial Oil combines the best oils for replenishing dry and tired skin. A beautiful blend of organic argan oil, organic rosehip seed oil, walnut oil, macadamia oil, jojoba oil and organic pomegranate seed oil along with essential oil carrot seed, rose geranium, lavender and frankincense. Use 2 to 4 drops twice daily, using upwards strokes, remembering to moisturize your neck also. 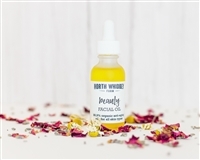 Use this Facial Oil in place of a moisturizer, for a completely chemical free, preservative free oil. Can be used directly under foundation.